This entry was posted in Advocacy, Living with the Disease and tagged Amy Brenneman, Camp Oasis, CCFA, Crohn's and Colitis Foundation of America, Crohn's Disease, Escape The Stall, IBD, Inflamatory Bowel Disease, Judging Amy, NG Tube, NYPD Blues, Private Practice, Scars, Surgery, Take Steps, Ulcerative Colitis. Well said! You make very valid points. I originally thought “hey, we’ll take awareness anyway we can get it” but after reading your post I completely agree. Their ad agency appears to have dropped the ball on effectiveness with this campaign. I think for their first real ad they wanted to play it safe but I think it might hurt us in the long run. Yea, I’m afraid so too. Looking at it from a glass half full stance, however, maybe it’ll open the doors for conversation? Most healthy people don’t talk about what goes on in the restroom. So, maybe, just maybe, it’ll spawn a conversation that’ll give us the chance to REALLY explain what we deal with? Hell, it wasn’t til I was diagnosed with cancer and preparing for surgery that I really explained to my husband what it was all about. Until, then the topic really never came up. With the ads, at the very least, might get people more comfortable in talking? I guess we can just pray for the best and hope it all works out. Agreed that they were taking the safe approach to a topic that can be very uncomfortable for many people. Perhaps this will be a gateway to highlight many of the serious issues that many of us deal with on a daily basis. I have difficulty criticizing anyone with Crohn’s or Colitis. As someone with Crohn’s myself, I know firsthand how life-changing awful these diseases can be. And you are certainly entitled to your opinion. Everyone’s opinion is valid. But you do miss some key points. The vast majority of the specific disease ads you are talking about are about diseases that people bring upon themselves (like lung cancer and emphysema) because they chose to smoke. And the commercials are trying to communicate with shock that if you choose to smoke, here’s what you are setting yourself up for. That is completely different form our situation. We did nothing to cause our Crohn’s and Colitis. It wasn’t our poor or reckless behavior that brought on our disease. On the contrary, the CCFA commercial and ads (you are not showing in your post the magazine ads which have copy talking about how devastating the symptoms are) communicate that anyone can get our disease and it’s likely that you the viewer know someone who has it. And far from making fun of the disease, it does exactly the opposite. The ad with clown shoes says this is no laughing matter. The one with the bride plays off how unforgettable her day was supposed to be and how unfortunately IBD is going to make her day unforgettable for all the wrong reasons. And the TV spot goes one further by also communicating that people with IBD suffer in anonymity (behind the stall door) but they don’t have to. Amy Brenneman essentially outs herself. Empowering. I tell everyone I have Crohn’s. It’s liberating. It’s way easier to live without the secret. Take another look. These ads are not intended to be funny and they are not funny. 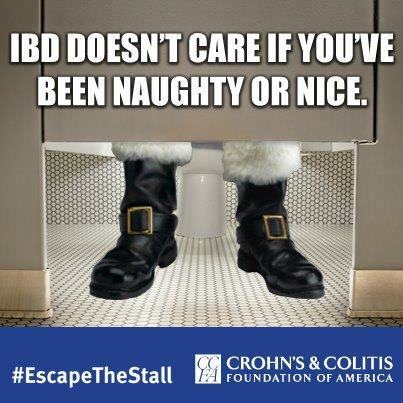 They communicate how serious IBD is. And they are simply smart and clever about how they do that. I appreciate your comment even though it is a different view. I understand your comment about smoking and people bringing it upon themselves, but most people don’t bring cancer on themselves. Yet we still see graphic ads at time for that. I think CCFA could have used a little bit of shock value. This ad is very clean cut and people will probably ignore the message behind it. A little shock would grab people’s attention and wake them up a little. I admit I have only seen the print ads. I would love to see the others. Please keep in mind that I still believe in CCFA and all they do and I am very appreciative of them. I will be helping with their Take Steps in Jersey this year and hopefully will work at Camp Oasis. It is just I think with these ads, they played it too safe. But everyone is entitled to their opinions and I am sure there are a lot of people with IBD that will agree with you. What we have to now focus on is not to argue of the ads but come together and spread the word. In my experience, most people are agreeing with this blog’s sentiments. But I have to agree with you…we share the same interpretation. I’m glad we can have these open discussions and be respectful of one another since we are all in the same boat. Check out Blood Poop and Tears’ blog post on it.